BTSCelebs had the special opportunity to view UP tv’s upcoming movie “Lyfe’s Journey”. This emotional tale follows the life of successful bank manger David Lyfe (actor Keith Robinson) who loses his upper class lifestyle after one extramarital affair. Actress Angell Conwell stars as his trusting wife Tricia. She is expecting baby number 2 when she discovers her husband’s infidelity. Her mother (DeEtta West) persuades her to divorce David and start a new life. One setback after another lands David on the streets with nowhere else to turn. The only way he’s saved is by grace. I thoroughly enjoyed watching this film. It was well written and had superb actors. 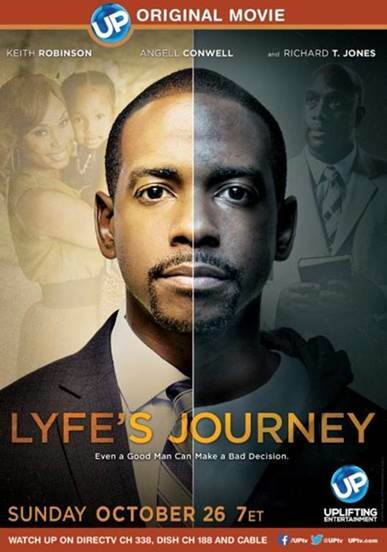 At the end of the film, I questioned why “Lyfe’s Journey” wasn’t being released in theaters. I highly recommend all ages to check out this moving motion picture. Bravo to Screenwriter Corey A. Prince, Director Ryan Richmond and the entire Swirl Films team! This gem sparkles brighter than any inspirational film I’ve viewed this year. “Lyfe’s Journey” premieres this Sunday on UP tv. This entry was posted in Movies, Reviews, TV and tagged Angell Conwell, Keith Robinson, Lyfe's Journey, Richard T Jones, Swirl Films. Bookmark the permalink.